As this year is the 100th anniversary of the end of the First World War, we are revisiting the Henfield connection with the Tomb of the Unknown Warrior at Westminster Abbey in London. Every year at the Service of Remembrance at St Peter’s Church in Henfield, a Union flag is displayed with pride on the alter steps. The flag came to the village from a Captain Brooks from Company 68 of the Graves Registration Unit, who played a part in the journey of the Unknown Warrior from the battlefields of the First World War to Westminster Abbey. In November 1920, after King George V approved the idea of honouring the unidentified dead from the Great War with a tomb in Westminster Abbey, four bodies were exhumed from each of the four main battle areas – the Aisne, the Somme, Arras and Ypres. The four bodies, each one laid out on a stretcher, were covered with a Union flag and placed in a chapel. Here the Director of the War Graves Commission, Brigadier-General Wyatt, selected one at random to be interred at Westminster Abbey as the Unknown Warrior and it was placed in the shell of a coffin. The three remaining bodies were taken to be buried in the military cemetery at St Pol. 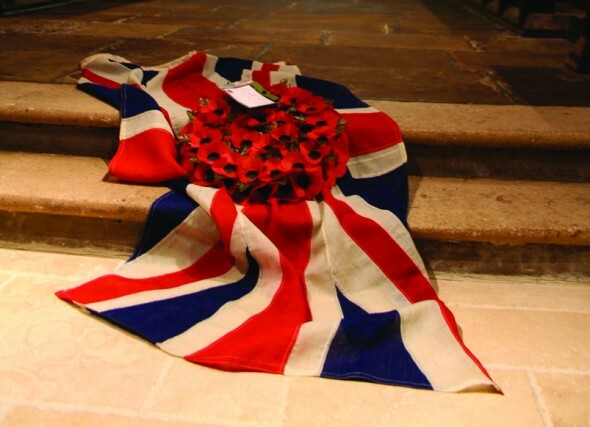 The Union flag that had covered the body of the Unknown Warrior in the chapel was not large enough to cover the coffin on its journey to Westminster Abbey. It was replaced with a larger one and Captain Brooks, who had been responsible for escorting one of the bodies to the chapel, kept the original flag. It was not until 1950 that the Union flag was brought back to England, after spending the Second World War in Belgium, hidden from the occupying German troops. Captain Brooks, whose family had lived in Henfield for many generations, presented the flag to the Henfield branch of the Royal British Legion in 1953. It stayed with them until 1976, when they presented it to Henfield Parish Council. Today, Henfield Parish Council loans the flag to St Peter’s Church and it is displayed during their annual Service of Remembrance – a little piece of national history in our village church. The journey of the Unknown Warrior from the chapel at St Pol to Westminster Abbey was one full of ceremony, more usually accorded to royalty. After staying in the chapel overnight, the coffin shell with the Unknown Warrior was transferred under guard to the medieval castle at Boulogne in France where it lay in state with a company from the French 8th Infantry Regiment standing vigil. From the castle the coffin was carried by British military pall-bearers and placed on a French military wagon for the mile-long procession to Boulogne quay. The coffin then travelled to Dover on HMS Verdun, escorted by six destroyers, and then on to London by train. Every station it passed through was filled to overflowing by people who stood in silence and lowered their heads as it passed by. After spending the night at London Victoria Station, the coffin of the Unknown Warrior began its final journey on 11 November 1920. It was placed on a gun carriage of the Royal Horse Artillery and carried in procession through immense and silent crowds to the Cenotaph. After King George V unveiled the Cenotaph (a “symbolic empty tomb”), he then placed a wreath on the coffin and at 11am the nation observed two minutes silence. The cortège then made its way to Westminster Abbey followed by the King, the Royal Family and Ministers of State. The guests of honour were a group of women all of whom had each lost their husband and all their sons in the war. Within the first week 1,250,000 people had filed past the tomb of the Unknown Warrior to pay their respects. It is now one of the most visited war graves in the world and is the only part of the Abbey floor that is never walked on.